I have no plans to upload my entire "Yukon Crews" piece, but I thought I would post a few paragraphs. Enjoy! 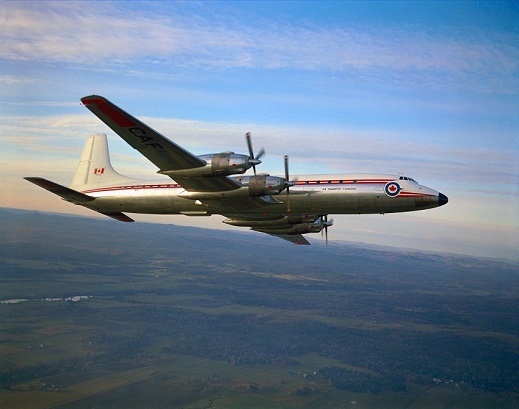 The Canadair “North Star” flew with RCAF Air Transport Command for a number of years. This aircraft was essentially an upgraded Douglas DC-4 powered by Rolls Royce “Merlin” engines and it was a workhorse providing movement of people and cargo. Nearing the end of its service life in the late 1950s there were discussions as to what direction to take to replace the aging, and non-pressurized, North Star. The Boeing 707 and Douglas DC-8 jets were now beginning to enter civilian service, with cargo versions also hitting the market, but there was some pressure to have a Canadian company undertake development of a new transport aircraft. These details are beyond the scope of this article so I’ll cut to the chase: Canadair developed the Yukon by modifying the four-engine Bristol “Britannia” airframe and matching it to a new powerplant, the Rolls Royce "Tyne 2" (which was still under development at that time). The first flight of a Yukon was made on November 15, 1959. Deliveries to 412 Squadron (VIP) began in mid-summer 1961. Veteran pilot Bill Cars explains the process of training pilots on the Yukon: “All the pilots that were selected to fly on the Yukon were all sent to Cartierville (Quebec) and we took the ground-school. Five of us were checked out by Canadair's test pilots. I was checked out by Scotty McLean, one of Canadair’s test pilots. As soon as we had been checked out then we came back down here (Trenton) with a couple of airplanes and checked out the rest of the guys . . . one guy ran OTU (Operational Training Unit) and three would work for him. I was going back up to 412 Squadron but we took all the rest of them and converted them on these airplanes." Once the pilots were converted onto the Yukon, then began an involved trial period. Cars elaborates: "We'd go on simulated trips, raising and lowering the landing gear five or six times, flaps five or six times, and so on. This was done to simulate multiple trips. We did a few long range trips here in Trenton. We took a couple of crews and flew over to Pisa, then from Pisa down to Leopoldville, and back up to Pisa and back home again just to see how it worked on long range trips. We took turns sleeping on the airplane and that kind of stuff. It was interesting work. It kept us going that summer." Canadair completed twelve Yukons for the RCAF: Two aircraft went to 412 'VIP' Squadron and the balance to (reactivated) 437 Squadron. However, the Rolls Royce Tyne 2 engines were to be troublesome for some time along with many teething problems with the Yukon itself, which only served to hinder the model from getting up to speed and providing regular service for the air force. Pilot James Lynch, who was to become the Squadron's Chief Safety Officer, remembers: “We had a couple of interesting things with the Yukon during the trial days. We had a case where Wing Commander Roly Lloyd (Commanding Officer of the training and development stage before the Squadron was formed) was coming back from a long-range flight and as they were approaching Montreal they had problems where they couldn't disengaged the 'auto pilot'. They tried to control the airplane and the ailerons wouldn't move at all. So the only way the aircraft could be maneuvered was rudder or powered back and forth. And they had no idea on Earth what had happened. The elevators were fine too. So they were able to jockey getting the airplane down with the reductions in power and rudder and so on." Once the Yukon had landed safely an inspection was undertaken and the culprit revealed. A large water tank located in the belly of the aircraft was used for various purposes, including providing drinking water. The tank's heater, needed for obvious reasons, failed on this flight and the liquid contents froze. Unfortunately some water had bled from its container and ran down and over the Yukon's control system. As Lynch explains, "The torque tubes got coated in ice; they couldn't turn. As it turned out, when they got to the lower altitudes to land, the things freed up and they were able to land the airplane fine". Jack Maitland, then 437 Squadron Commander and pilot, found the process of getting the Yukon into a regular routine to be very trying: “We had a difficult first eighteen months just keeping them serviceable." Many of the early problems afflicting the Yukon were due to the Rolls Royce Tyne 2 engines. Maitland gives credit to the aircraft mechanics for getting hours out of the Tynes. Once it was clear that the Yukon had successfully made the transition to full flying status Air Transport Command could do its job. Maitland adds dryly, “we started flying it in the summer of ’61 so by about Christmas of 1962, nearly eighteen months, we were able to more or less able to depart on time. Not always, but…." According to Maitland, the first official flight of a Yukon took place on January 2, 1962 (from Trenton to Marville) so there were many months of “official flying” before a degree of serviceability was obtained. 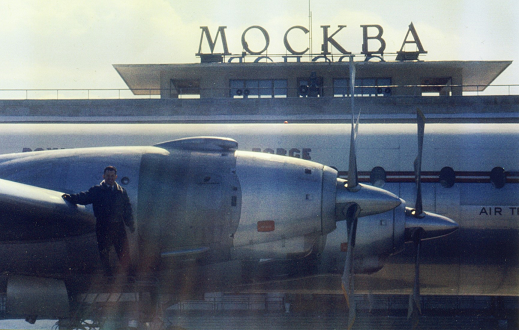 Pilot Jack Maitland poses with his "Yuke" in Moscow. One thing that was obvious to me was the fact that the individuals I interviewed all had fond memories about flying on the Yukon – and a lot of fun was apparent in the rapport displayed during the group interview I did as part of my research in CFB Trenton. This really showed when I thought I would ask a seemingly innocent question – one brought on after hearing of some of the trips to a few 'hot-spots'. My question came out as: “Were you guys ever armed?” This elicited an immediate reaction from [Navigator] Bob Burke: “We had security people. My god, I wouldn't give these guys guns!” [Flight Engineer] Bernie Hazleton chimes in with, “It's bad enough giving them a screwdriver”. [Pilot] James Lynch sums up his feelings on the Yukon: “The aircraft was definitely a well designed aircraft. It was a very, very nice aircraft to fly. It really was a beautiful aircraft." The Yukon and its implementation was a memorable chapter in Canadian aviation, certainly Canadian military aviation. It was an aircraft developed and flown to fulfill a requirement laid out by our armed forces and it performed admirably – as several people in this article have noted. Unfortunately, because so few units were produced, coupled with the fact that Canadians seem to have a hard time 'caring' about most of what we do, especially regarding our military and the many successful and historically relevant exploits therein, this aircraft is destined to be all but forgotten by all but the most die-hard enthusiasts.